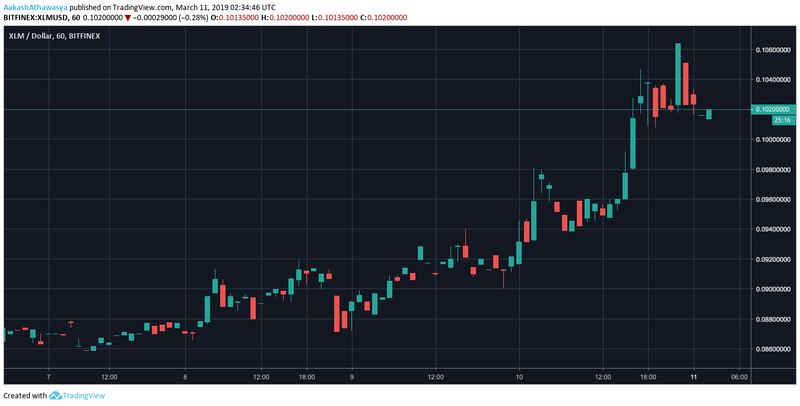 Stellar Lumens [XLM] was pushed up by the bulls as other top coins were in the red, resulting in sideways market movement. The global market cap noted a minimal incline this weekend and stood at $135 billion. On March 7, the German financial media house, Börsenmedien AG acquired SatoshiPay, a crypto-startup that offered micro-payment solutions and had blockchain projects with Stellar, Aergo and Aeternity. For the partnership, Stellar’s blockchain technology was leveraged, allowing the media house to initiate a pay-per-article scheme, using SatoshiPay’s payment solution to send funds from the reader to the publisher. The Stellar Development Foundation will also supply free credits to new readers, allowing them to purchase content on Börsenmedien AG’s media platform using the SatoshiPay wallet. This adoption drive pushed the coin up by a relatively significant 9.23 percent against the US dollar over 24 hours, at press time. Prior to the aforementioned announcement, the Stellar Lumens’ price had been rising. The peak of this bullish swing came on March 10, when the coin pushed up to break the $0.10-mark. At 1430 on March 10, the coin was priced at $0.092 and pushed up by 8.63 percent to reach $0.1006, followed by another rise to $0.1012, its highest point in over a month. In terms of market cap and positioning, XLM remained in the ninth position. The coin was sandwiched between the top stablecoin Tether [USDT] and TRON [TRX]. Stellar Lumens trailed USDT by under a little over $100 million and was ahead of TRX by a good $450 million. The coin’s market cap rose to $1.71 billion as the weekend commenced. In less than two days, the market cap added over $200 million, with XLM’s valuation peaking at $1.948 billion. Despite the bullish momentum, Stellar Lumens failed to re-enter the $2 billion club, and had a market cap of $1.907 billion, at press time. Exchange-wise, the Chinese cryptocurrency exchange ZB.com took the top spot with 9.67 percent of the global trading volume via the trading pair XLM/USDT. However, ZB.com was accused of wash trading to inflate volume in the past, hence investors should be wary. The next two spots were taken by Binance, in the trading pairs XLM/BTC and XLM/USDT respectively, accounting for 9.46 percent and 8.23 percent of the XLM global trading volume.